My grandmother was never known for her cooking. Instead, she was known for her passion for cleaning, her scarves and the costume jewelry that she wore with the confidence and style of a 1940’s movie star. Also her welcoming smile, gregarious laugh and many other amazing things that make us all miss her everyday. However, a good cook she was not. She overcooked any meat she came across to death and despite being raised on a farm in Kansas, most of her veg came from a can. Despite her flaws in cooking, every once in a while she made something amazingly delicious. Case in point, her very special ‘Liver and Onions’ recipe. As a youngster, I approached it expecting it to be gross but I always ended up pleasantly surprised and gobbled up the whole plate. Liver gets a bad reputation. Some people say that it is gritty and has a strong metallic tang to it. However, when I remember my grandmother’s liver and onions, I don’t recall either of these traits. Why is that? Was it a special magic spice she coated it with? Nope. She cleaned it thoroughly and soaked it in milk which is the ultimate magic trick to getting tasty liver. Simply add a little salt and pepper plus some carmelized onions on top and it is damn good. This recipe however is a bit more exotic but I like to think it’s something she’d like. 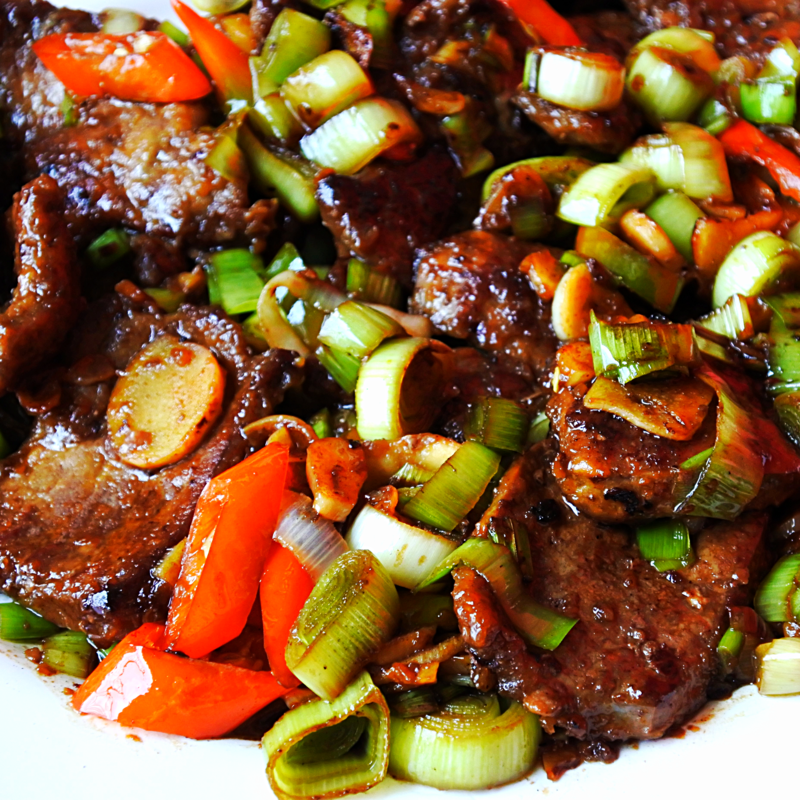 The liver is soft and salty from the soy sauce and deliciously paired with all the good stuff: garlic, ginger, a touch of Szechuan peppercorn, chopped chilies and leeks. It’s a big hit in my house and is soon becoming one of my favorite stir-fry dishes. Even if you’re a little apprehensive towards liver, I suggest you give it a try. It just might turn out to be one of your favorite dishes as well. Grandma would approve. Clean beef liver, cut away any discolored parts and let soak in milk overnight in the refrigerator. Wash off milk and cut into thin slices. Season with sea salt and dredge in cornstarch. Heat oil in large wok over medium high heat. Add Szechuan peppercorns and cook until peppercorns have infused into the oil. Remove with a slotted spoon and discard. Turn heat to high and add liver. Stir-fry for 3-4 minutes or until browned. Be careful not to overcook the liver as it has a tendency to get tough. Remove from heat and set aside on a plate nearby. Next, add garlic, ginger and chilies. Stir-fry together for a minute or so until fragrant. Add chopped leeks and fry for 1-2 minutes or until soft. Add cooked livers and stir-fry together. Add soy sauce, stir together and cook for a minute or so until everything is evenly coated. Remove from wok and serve hot. Enjoy! Clean beef liver, cut away any discolored parts and let soak in milk overnight in the refrigerator. Wash off milk and cut into thin slices. Season with sea salt and dredge in cornstarch. Heat oil in large wok over medium high heat. Add Szechuan peppercorns and cook until peppercorns have infused into the oil. Remove with a slotted spoon and discard. Turn heat to high and add liver. Stir-fry for 3-4 minutes or until browned. Be careful not to overcook the liver as it has a tendency to get tough. Remove from heat and set aside on a plate nearby. Next, add garlic, ginger and chilies. Stir-fry together for a minute or so until fragrant. Add cooked livers and stir-fry together. Add soy sauce, stir together and cook for a minute or so until everything is evenly coated.